Barnsley began life without boss Lee Johnson with victory over Bury for their seventh straight League One win. The Tykes, who Johnson left for Bristol City on Saturday, were ahead early on with Marley Watkins' great solo goal. Sam Winnall sweetly struck his 17th of the season for the hosts after clever work from Conor Hourihane. Adam Hammill finished Ashley Fletcher's centre for 3-0 before Leon Clarke shot wide when one-on-one for Bury, managed by ex-Tykes boss David Flitcroft. Barnsley had Johnson's former assistant Tommy Wright and coach Paul Heckingbottom in temporary charge. 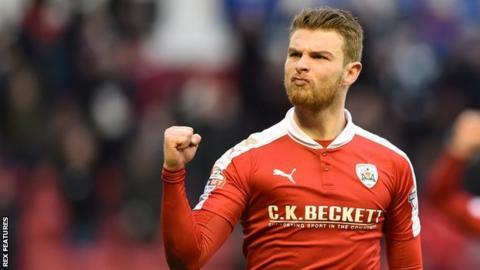 Having reached the Johnstone's Paint Trophy final with victory over Fleetwood on Thursday, they moved up to 10th and are now five points off the play-offs, while Bury stay 15th. "We tried to stress that Thursday had gone and it was important to focus on this game in terms of application, momentum and getting their minds right in what was another big game. "We were a little bit sluggish at times, especially first half, but again it shows if your mind's right, you're OK as we got stronger as the game went on. "It's been a hectic week, but to be honest it's probably better that way because you get everything over and done with in a few days. "We've managed to get the result which is great so now we just move forwards and carry on as normal." Match ends, Barnsley 3, Bury 0. Second Half ends, Barnsley 3, Bury 0. Attempt saved. Josh Scowen (Barnsley) right footed shot from the centre of the box is saved in the centre of the goal. Substitution, Barnsley. Shaun Tuton replaces Adam Hammill. Peter Clarke (Bury) is shown the yellow card for a bad foul. Hand ball by Josh Scowen (Barnsley). Attempt missed. Ashley Fletcher (Barnsley) header from the centre of the box misses to the right. Substitution, Barnsley. Josh Scowen replaces Sam Winnall. Attempt missed. Josh Brownhill (Barnsley) header from the centre of the box is too high. Corner, Barnsley. Conceded by Craig Jones. Corner, Barnsley. Conceded by Peter Clarke. Sam Winnall (Barnsley) wins a free kick in the attacking half. Attempt missed. Leon Clarke (Bury) left footed shot from the centre of the box is close, but misses to the left. Goal! Barnsley 3, Bury 0. Adam Hammill (Barnsley) header from the centre of the box to the top left corner. Assisted by Sam Winnall. Attempt missed. George Miller (Bury) header from the centre of the box is too high. Attempt missed. Leon Clarke (Bury) header from the centre of the box misses to the right. Corner, Bury. Conceded by Kevin Long. Substitution, Bury. George Miller replaces Reece Brown. Substitution, Bury. Jacob Mellis replaces Danny Pugh. Corner, Bury. Conceded by Lloyd Isgrove. Goal! Barnsley 2, Bury 0. Sam Winnall (Barnsley) left footed shot from the centre of the box to the bottom right corner. Assisted by Conor Hourihane. James Bree (Barnsley) wins a free kick in the defensive half. Attempt missed. Aidan White (Barnsley) right footed shot from the centre of the box is too high. Substitution, Bury. Craig Jones replaces John O'Sullivan. Danny Mayor (Bury) is shown the yellow card for a bad foul. Corner, Bury. Conceded by Adam Davies. Attempt saved. Adam Hammill (Barnsley) right footed shot from the centre of the box is saved in the centre of the goal. Second Half begins Barnsley 1, Bury 0. First Half ends, Barnsley 1, Bury 0. Conor Hourihane (Barnsley) wins a free kick on the left wing.